Yummi Pouch is a revolutionary way to take liquid snacks for your kids without the mess. No need for glass containers that break, or plastic full of bpa! Yummi Pouch has created a variety of snack pouches for holding your applesauce, smoothie, yogurt and more! A variety of sizes for different sized kiddos. Of course my son chose to use the smallest one for his pear sauce. This size would be perfect for toddlers and babies as they hold about 2.5 ounces of food. He enjoyed it though, I did have to fill it up twice for him. We are bumping him up to the sport pouch! I received for review the great variety below. 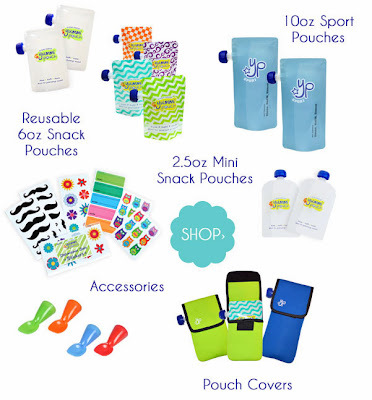 The secure zippered section makes the pouches easy to fill. You can use a measuring cup, spoon or funnel for filling it up. They do have a "fill to here" line so that you don't overfill. He was so excited to try pear sauce in his Yummi Pouch! He is the baby of the family and insisted that he wanted to try the littlest one of the bunch. These were easy for him to use, easy to get the sauce out of. I tried to clean it out in between his pear sauce rounds to make sure it would easily come clean. You just open the zippered bottom to clean it out. Run water through it, soak it in your dishwater, or even use a bottle brush to get to all of the corners. 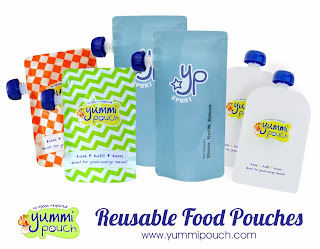 Check out Yummi Pouch on these social media sites! Use code YPSAVE10 for 10% off your order!